Since the introduction of the TOEFL iBT in 2005, there have been significant changes to some of the test questions, particularly the integrated writing and integrated speaking tasks. The new 2011 edition of Delta’s Key reflects these changes with the addition of many new practice questions and updated strategies. All of the content in our new edition meets the current specifications of the Internet based TOEFL iBT. We have listened to the concerns of our users, and the new edition of Delta’s Key incorporates feedback from students and instructors. Now, for the first time, we include the companion audio in mp3 format on a single CD with the book. This means the full nine hours of audio can be played on a variety of media players. The audio does not have to be purchased separately. Features 35 units of study in reading, listening, speaking, and writing Four full length tests in TOEFL iBT format 1,200 questions in the units, quizzes, and tests Answer key, audio script, and score charts Abundant skill practice for 15 weeks of study Nine hours of audio in mp3 format included with the book. Speaking skills are evaluated. Some tasks involve integrated skills, such as reading-listening-writing. Knowledge of grammar is not tested separately but is assessed indirectly throughout the test. 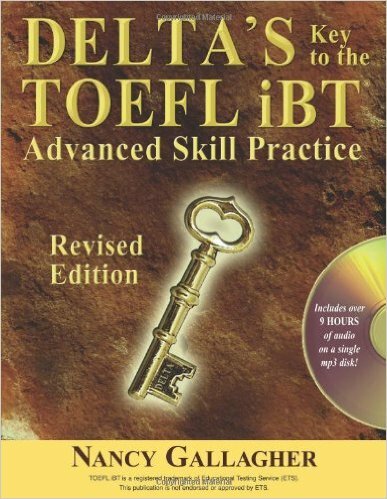 Delta’s Key to the Next Generation TOEFL¨ Test is an all-new program designed specifically for the new version of the test. The course provides ample practice in the English skills evaluated by the new test, along with useful strategies and practical ideas for individual, pair and group activities. (2) to build the language skills necessary for academic success in an English-speaking environment. Advanced Skill Practice contains 36 skill units and four full-length practice tests, with more than 1,200 test questions that are similar in form and content to those on the real test. There is enough material for approximately 15 weeks of study. The book can be used in a number of ways: as the primary text in a comprehensive preparation course; as the primary or secondary text for courses in reading, listening, speaking, or writing skills; or as a resource for independent study, laboratory, or tutoring. The skill units contain five essential activities: Focus, Do You Know…?, Practice, Extension, and Progress. Focus An opening exercise to focus attention, activate prior learning, and stimulate inductive thinking. Do You Know…? A description of a specific skill in reading, listening, speaking, or writing that defines relevant concepts, provides sample questions, explains answers, and identifies useful test strategies. Practice Sets of practice questions to foster ease with TOEFL¨ test form and content, challenge students to apply their skills, and build skill retention. Extension Classroom activities that promote cooperation, stimulate discussion, extend skill practice, guide peer review, and link the classroom with the real world. Progress Thirty-four timed quizzes simulating parts of the test, with each quiz evaluating the skills studied in one or more units. By Ajay Kotha: Very Good for speaking and Writing in Toefl iBT. Getting a good score in Toefl iBT is all about practice. These 10 CDs have a lot of exercises to get you better. I was weak in speaking and writing. I had to get a minimum score of 26 in speaking and 24 in writing. The first time i attended a 2 week training classes and used a number of books and i only got 89. Then i bought this book and CDs and all i used was this one. I got a score of 108. Though it is expensive, I would certainly recommand this book and CDs. English is my 2nd language but I had studied math and science from elementary to high school in English and my college study for medicine was in English .I searched for TOEFL books and I was lucky to choose this one (the book +the CDs) although few reviews were there. But I can assure you that this is the best book if your level in English is not a beginner.I borrowed others books for TOEFL from a friend (Princeton,Longman) and they were very simple to the extend I felt silly studying from them. The CDs are very very good ,the practice tests in the book it self are great and adds up to your language. I definitely recommend this CDs +the book for those with advanced level in English language. It is the most reliable, most complete and most helpful book for TOEFL exam. The delivery is fast, even sooner than what I expected, the only negative comment is how they packed the books, it arrived with a folded cover page, the packager is not careful enough....i am giving the book and the delivery 4 stars! for the seller and packaging 3 stars!